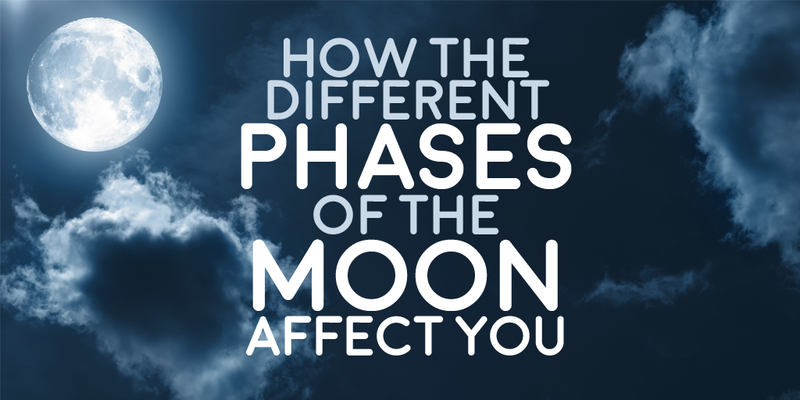 How The Different Phases of the Moon Affect You! 6Help Gostica raise the vibrations and SHARE this article with your family and friends. The moon effects many things around us, such as the tides, the seasons and the earth’s rotation, but did you know that the different phases of the moon can also have an effect on your mind, body and energies? The New Moon occurs when the moon is between the sun and the earth, and is therefore in darkness because the side of the moon we see is not lit by the sun. This moon phase is known as a time for new beginnings, and it can affect us in many ways. We tend to have more energy during the new moon, experiencing sudden spurts of energy – take advantage of this! Our appetite also increases during this time. You might feel restless and are more likely to wake up early in the mornings. You might find that during the new moon your mind is full of new ideas! You will find tasks such as writing easier, and you will suddenly have clearer insight on certain situations. Use this time to make full advantage of your extra creativity and clear mind. Your feelings will be a little more delicate and you might feel slightly shy, nervous or self-conscious during a new moon. You may find it beneficial to avoid large crowds for this reason. Occurring after the new moon, this phase is symbolic of construction and momentum. You may notice an increase in thirst and hunger during this phase, and you might find that you lose weight. Your energy starts to become more balanced, however, between 10am and 2pm will be best for any physical activity. Any feelings of anxiety or shyness begin to reduce and you start to feel more balanced during the first quarter moon. You will start to feel more outgoing, although it is also normal to feel slightly detached during this phase. During a first quarter moon, plans will start to develop and you are at risk of taking on more than you should, so be careful not to exert yourself too much. The moons power is at its strongest during a full moon and all efforts will begin to show. Our physical energy increases during a full moon, our strength and stamina increases making it a great time to work out and exercise. Sexuality is at a peak at this phase and we are also more likely to remember our dreams and stay up later than usual, as energy peaks in the evening. Opposite to the new moon, a full moon is when we are most likely to enjoy crowds, we are more confident and sociable during this stage. We also find ourselves to be more talkative and willing to share ideas with others. The last quarter occurs after the full moon and is known as a time for reflection, analysing and clear thinking. Our appetite can decrease during the last quarter, energy levels dip and we may find ourselves more likely to need a nap and have a lazy afternoon, listen to your body and take some time out if needed. Emotionally, we crave attention during the last quarter phase. We become clingier and feel the need to be cared for by others. You may notice slight weight loss during this moon phase. If you’re focused on achieving something specific, or are intrigued by what situations you should avoid and when, then understanding the moon phases might help to plan ahead!